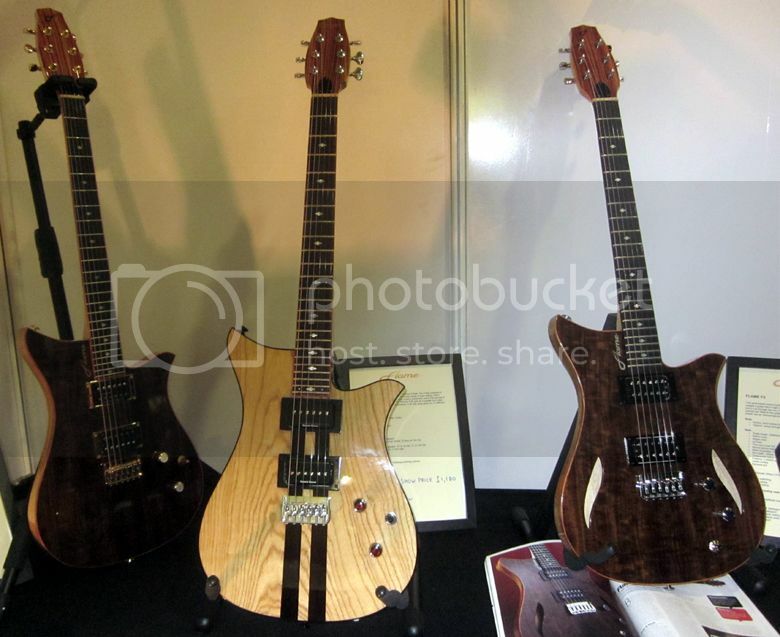 Guitar Blog: Review of UK Guitar Show 2012 - great to see Britain's luthiers out in force! 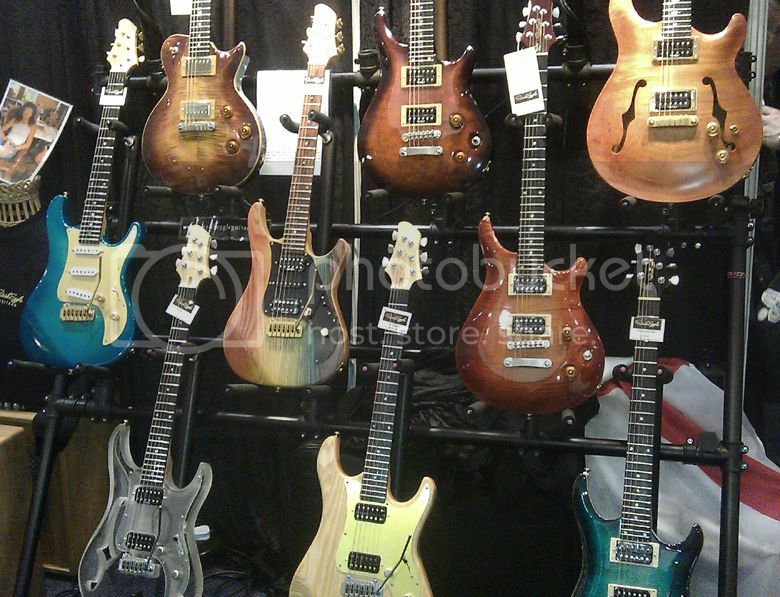 Review of UK Guitar Show 2012 - great to see Britain's luthiers out in force! guitarz.blogspot.com: Please note that the photographs in this blog post are the property of Gavin Wilson and Luke Boardman - please ask permission before copying and - when using elsewhere on the internet - please link back to this blog post. Thank you! 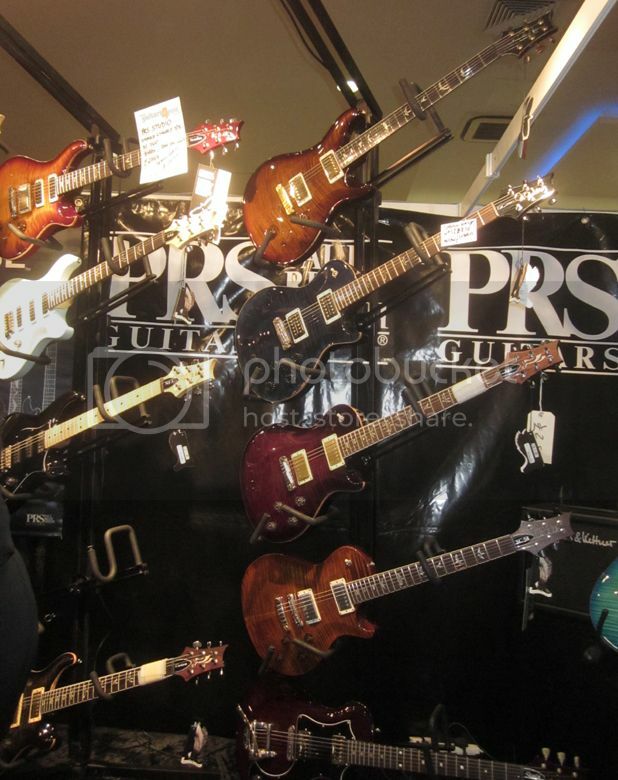 The UK Guitar Show was held in Birmingham over the weekend of 25-26 February 2012. Whilst not quite as big as other similar events (e.g. 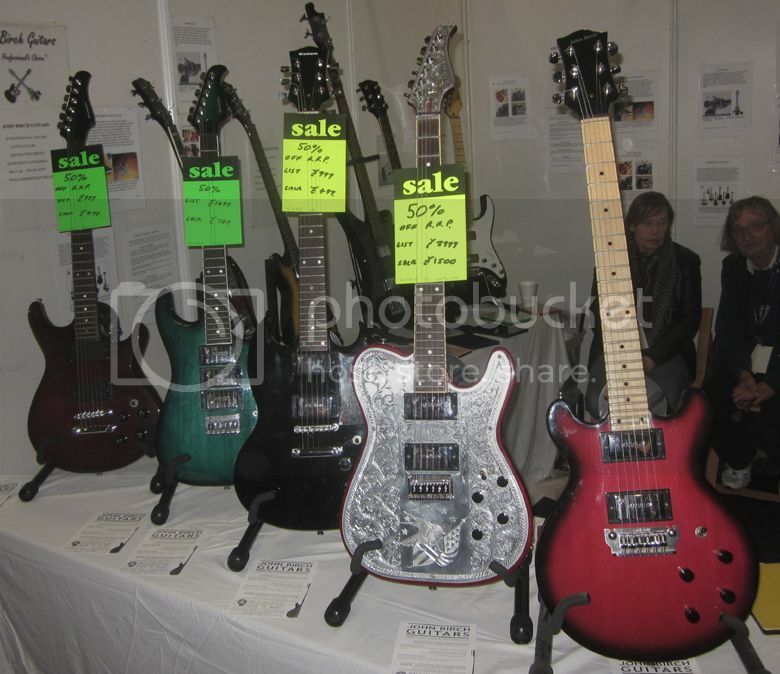 the London International Music Show which I last attended in 2009), what was firmly impressed upon me was the number of UK-based luthiers in attendance. 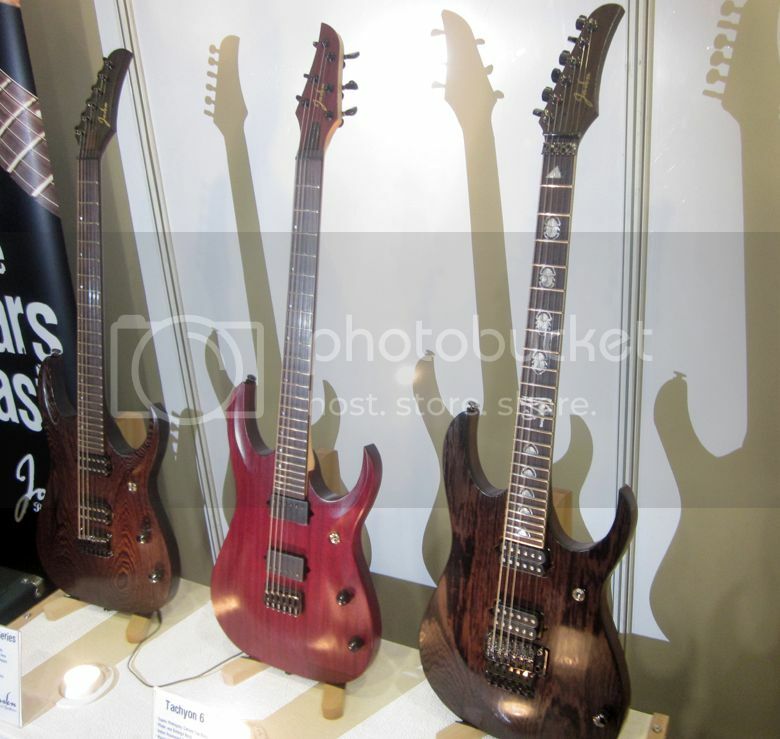 Based in Carmarthenshire, Wales, Jaden Rose Guitars are closest to me geographically, so I'm going to start with them. Jaden Rose, the man behind the eponymous brand, personally builds each of these beautiful no-nonsense guitars from exotic timbers, usually equipped with his favourite DiMarzio pickups and with natural finishes which not only show off the beauty of the timbers, but also makes sense sonically; Jaden told me he'd experimented with different finishing methods and that he could hear the detrimental effect that paint had on a guitar's tone. 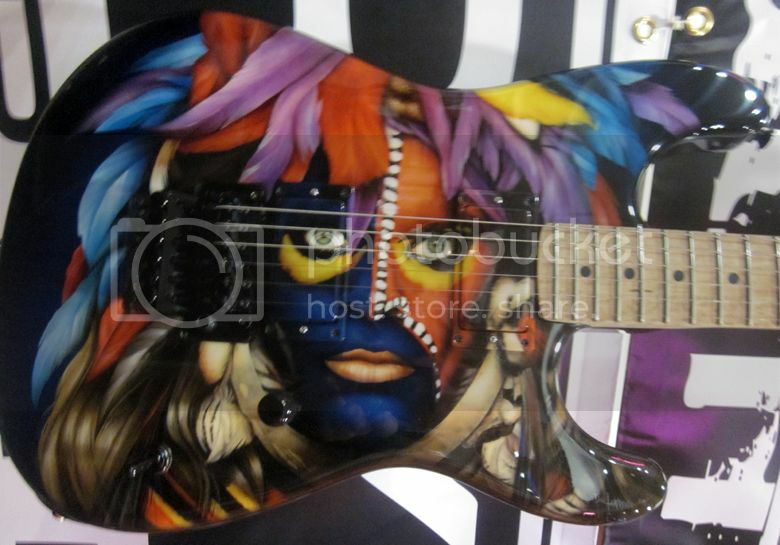 Despite this, Jaden will occasionally produce a guitar with a more outlandish finish, if that is what the customer wants, such as this "swirl"-finish guitar, pictured below. Style-wise, they look as if they could be a shredder's dream. The Rolls Royce of Shredders, perhaps? 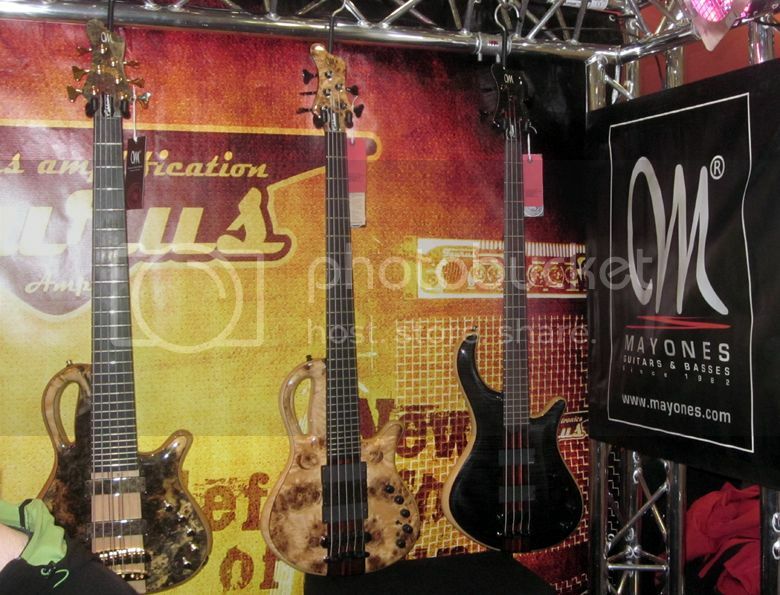 7-string and multi-scale models are also available. 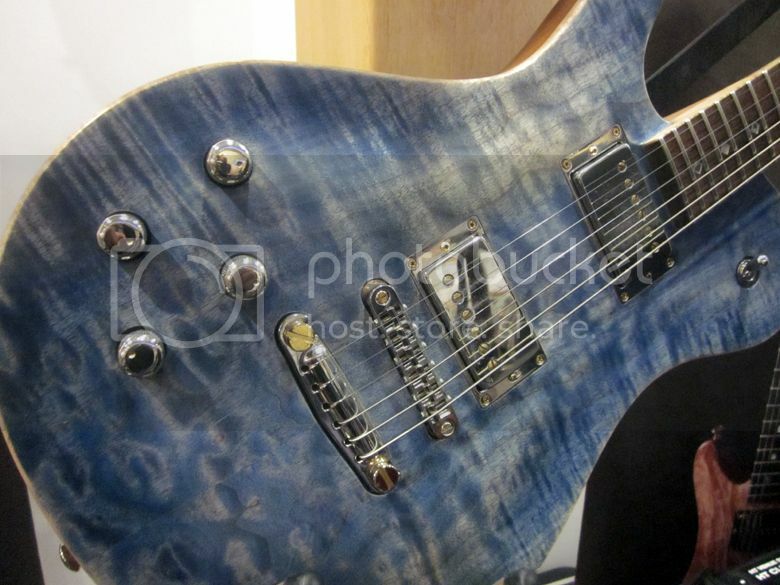 JJ Custom Works from JJ Guitars (as pictured above) are certainly very eye-catching instruments, exquisitely crafted and finished and featuring gorgeous flamed and quilted tops. I got my paws on a couple of them and can confirm they feel great and are comfortable players too. 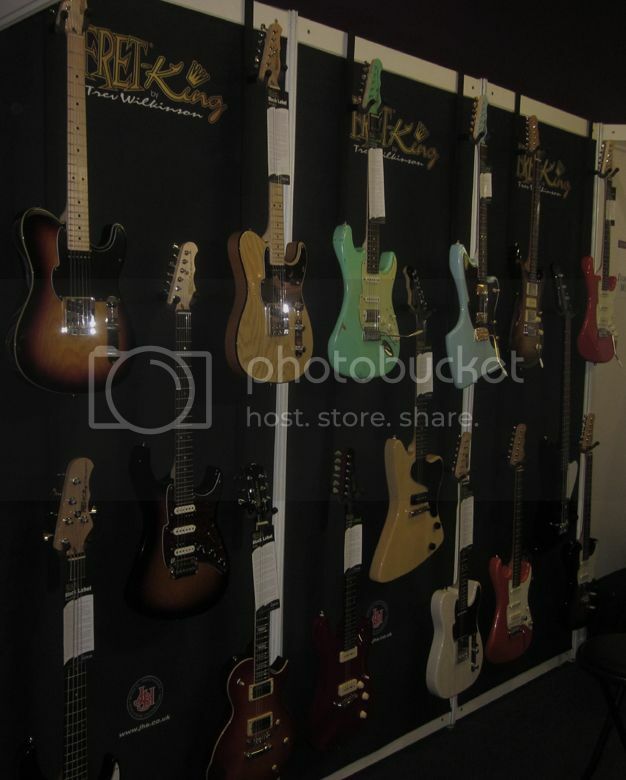 Models include the Retrolux (1st and 2nd as pictured above), the singlecut Electra (3rd and 5th in line) above) and the Jewel. All have a 25" scale length and coil tap facility or tone contour EQ for increased palette of sounds controlled via a push-pull tone control. A JJ Guitars innovation is the 6-way switch controlling a pair of humbuckers, and allowing for a huge array of tonal possibilities. 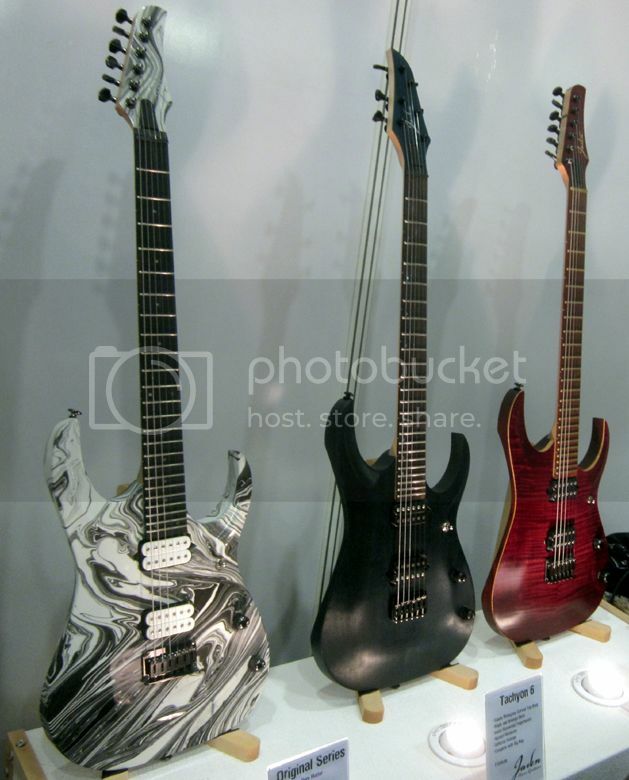 As well as the normal three positions that you would expect, this system also offers the outer coils from each humbucker being used in parallel, inner coils in parallel, or inner coils in series. 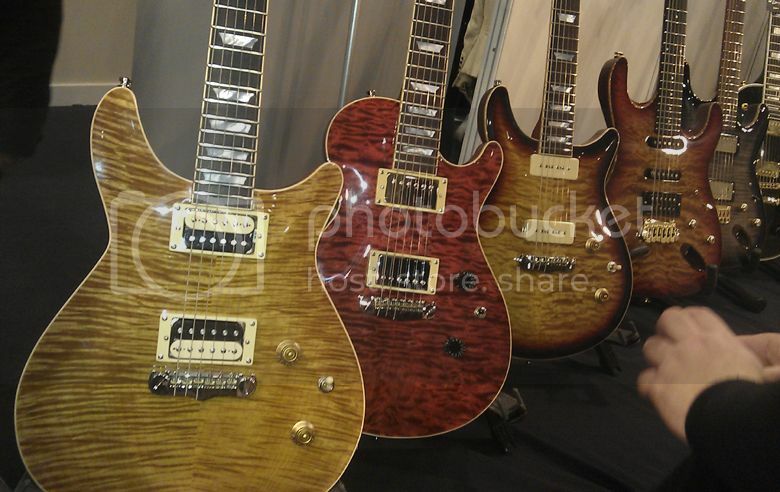 To my mind they out-PRS Paul Reed Smith guitars. AND they are made in the UK. 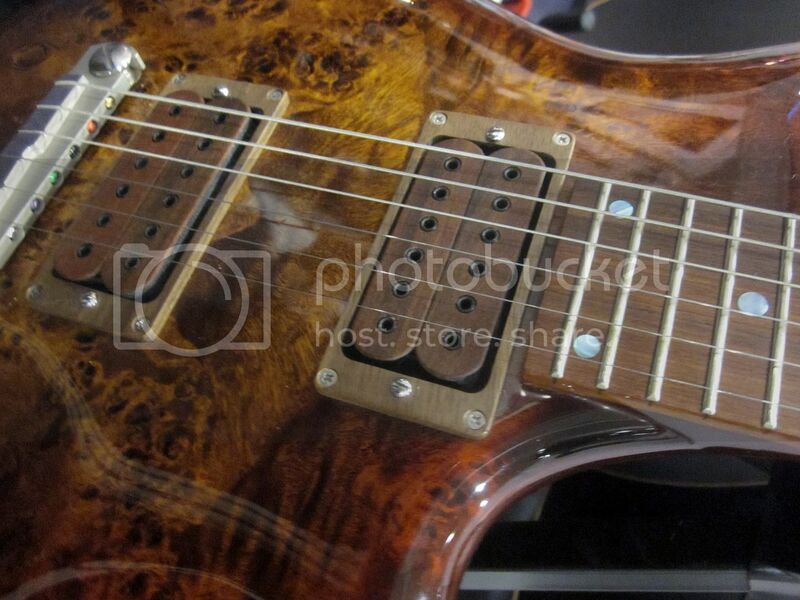 Flame Guitars (pictured above) are built by David Kennett in Sutton on the outskirts of London. David has been building guitars for over 20 years, and has designed his F1-F5 series of guitars to offer something a little different from the "same old same old" designs we see trotted out time and again elsewhere. 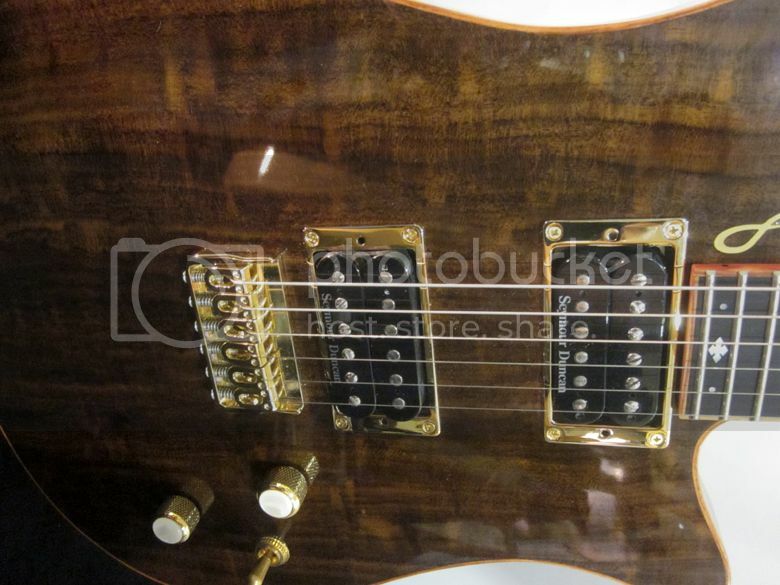 Whilst he has his basic models, he still offers a fully customisable service, allowing the customer their own choice of timbers, pickups, hardware, etc. 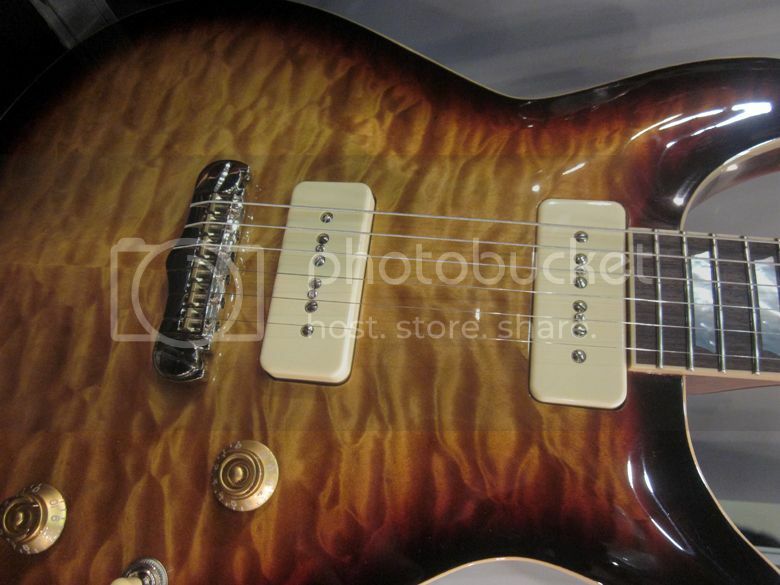 Flame Guitars are fitted with Earvana nuts for correct intonation all the way up the neck, and pickups direct mounted to the guitar's body with maximum tone transfer. Each is finished with a water-based lacquer, which allows the beauty of the chosen timbers to shine through. 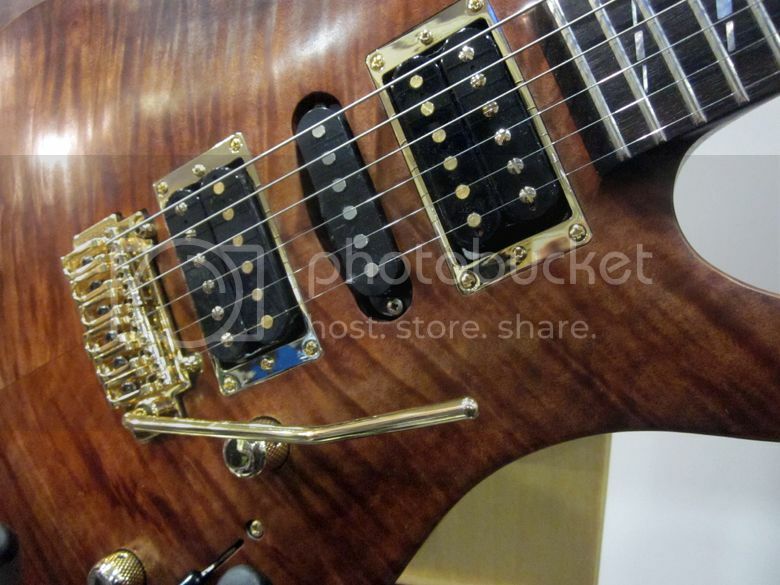 One particularly interesting area of construction is the way in which the neck is mounted onto the body: the neck is mounted via a tenon as used on set-neck guitar, but is actually bolted from behind and also from inside the body from the neck pickup cavity. 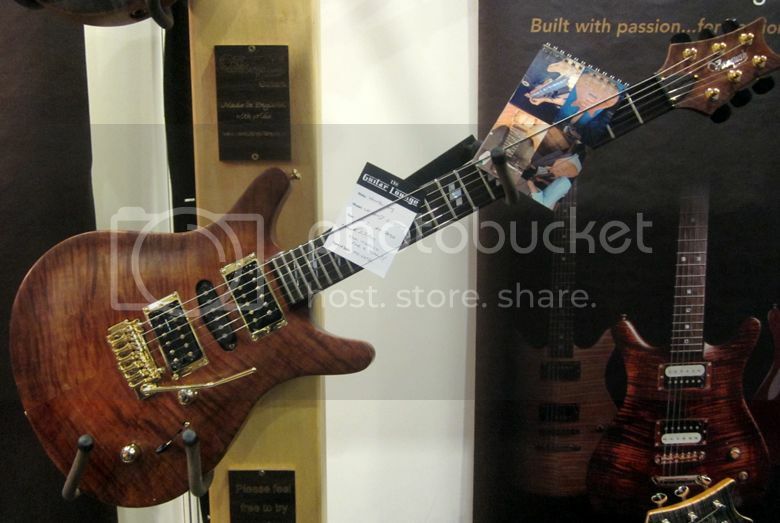 This is what David calls a "bolt-in" neck; he told me that he had experimented with traditional bolt-on and glued-in necks, but that his bolt-in system was the one that he found worked the best, and also allows the neck to be detached for servicing the instrument. 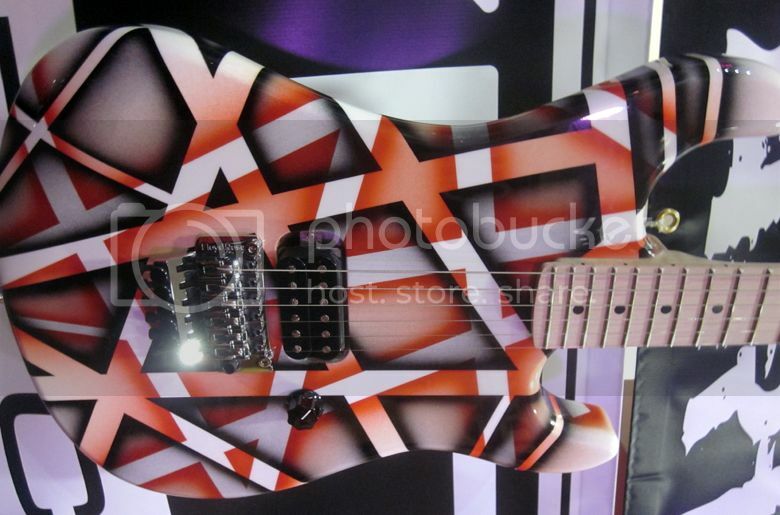 Vanquish Guitars are another British-made brand that look like they could give PRS more than a run for their money. 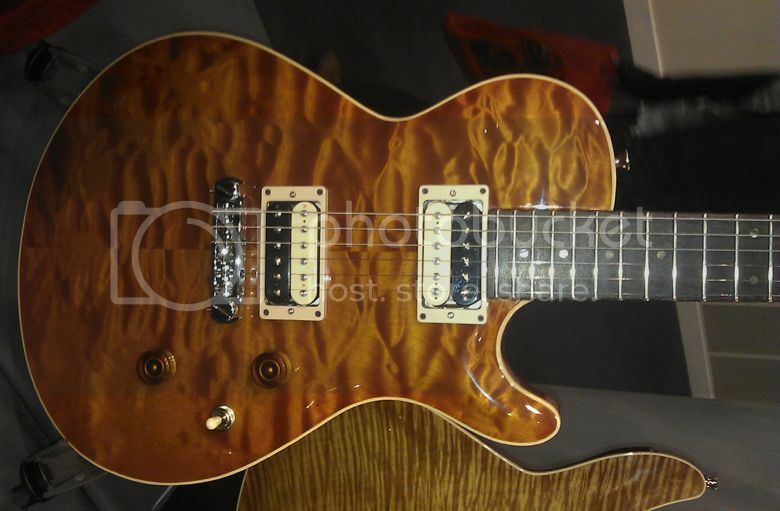 Once again we see exotic tonewoods and gorgeous natural hand-rubbed oil and wax finishes, and not a Fender or Gibson clone in sight. Whilst all the elements are customisable, Vanquish Guitars are fitted with a custom-made VQ range of (British-made) Bare Knuckle pickups as standard. 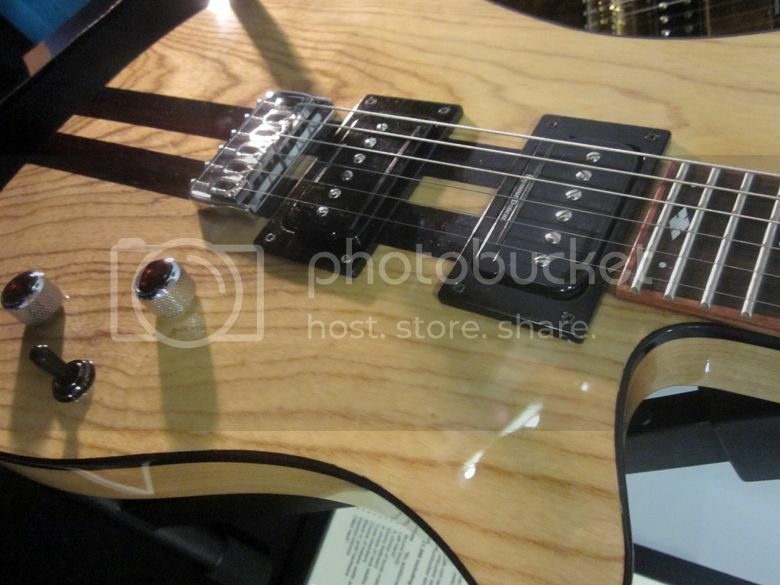 Vanquish Guitars also feature a "patent applied for" unique designed neck join for increased wood to wood contact, Buzz Feiten tuning, and have Musitrac microchips installed as standard for peace of mind in case of theft. 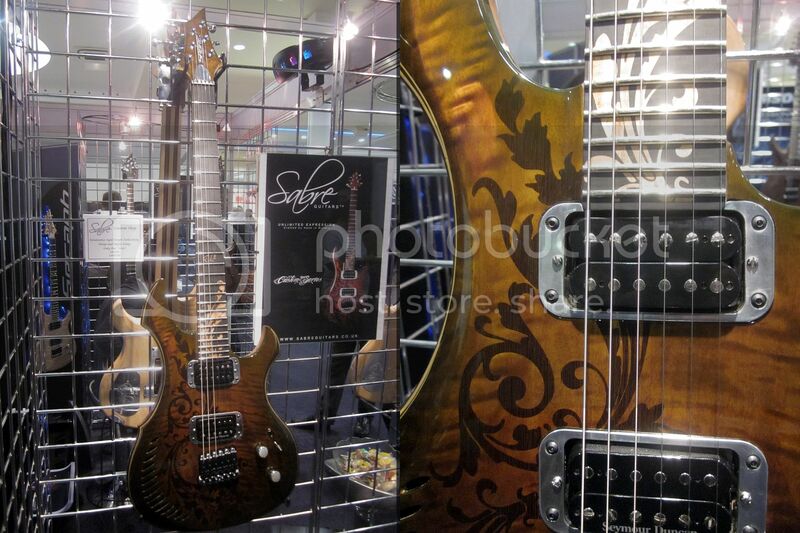 Sabre Guitars (pictured above) of Newmarket in Suffolk also had some tasty-looking guitars on display with some quite stunning inlay work and finishes very much in evidence. For those wanting something, more traditional (shall we say? 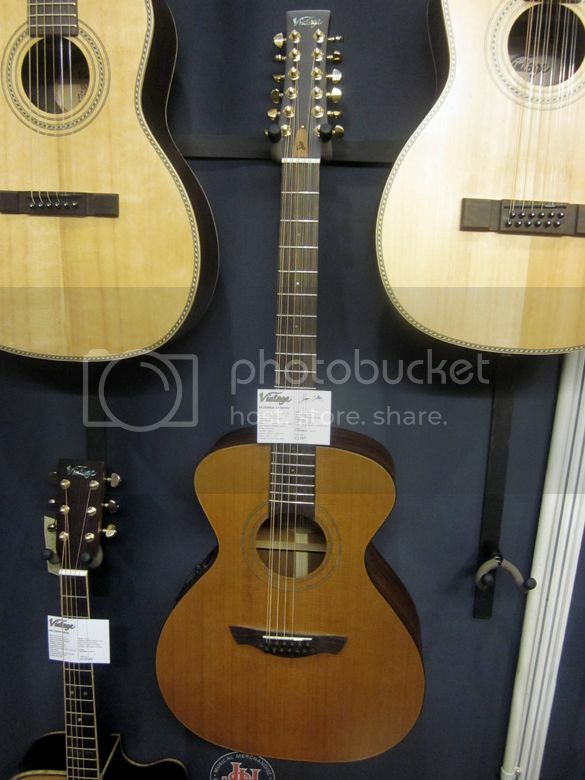 ), but still wanting to support British luthiers, Beryl Guitars make some very fine, high quality, versions of certain American designs (pictured above). 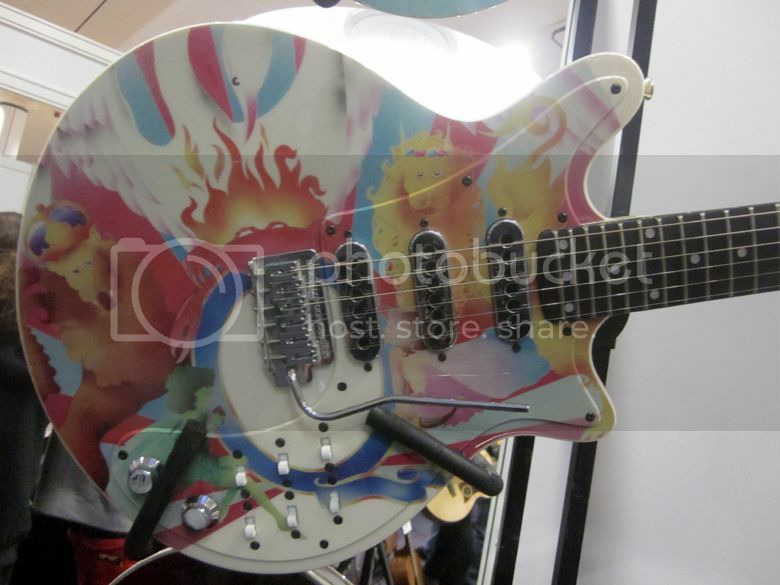 John Birch Guitars are still going strong, although alas some of their wilder designs such as the now legendary Superyob guitar were conspicuous by their absence. 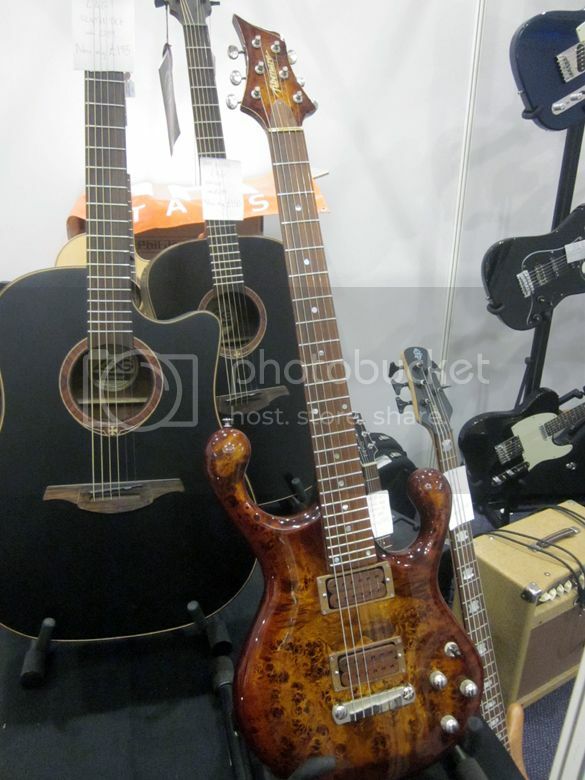 John Birch himself actually died back in 2000, leaving the business to luthier John Carling who had been working alongside Birch when the company was re-launched in 1993. 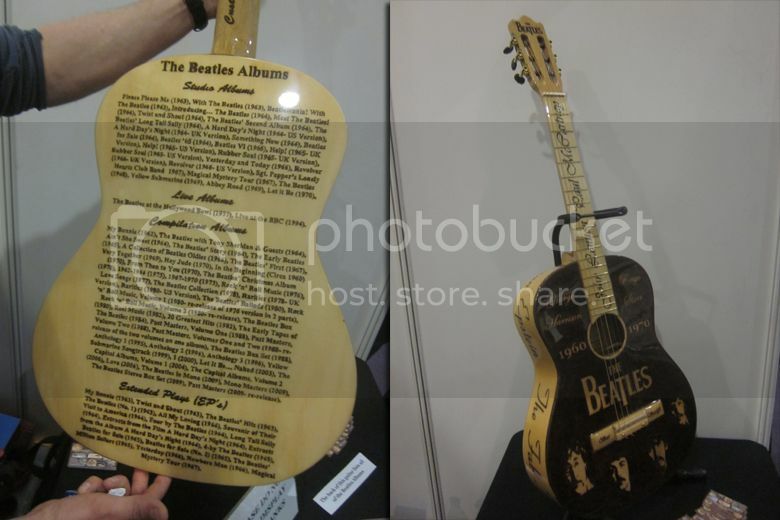 Another well-established UK guitar maker, Patrick Eggle were also present, although this display (above) looked near identical to one I saw three years ago. 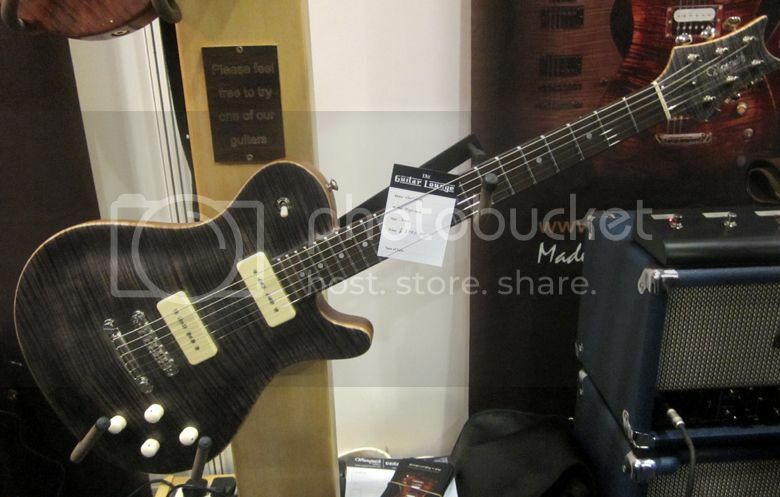 The UK-made guitars we've been looking at so far are high quality boutique instruments, costing thousands of pounds. 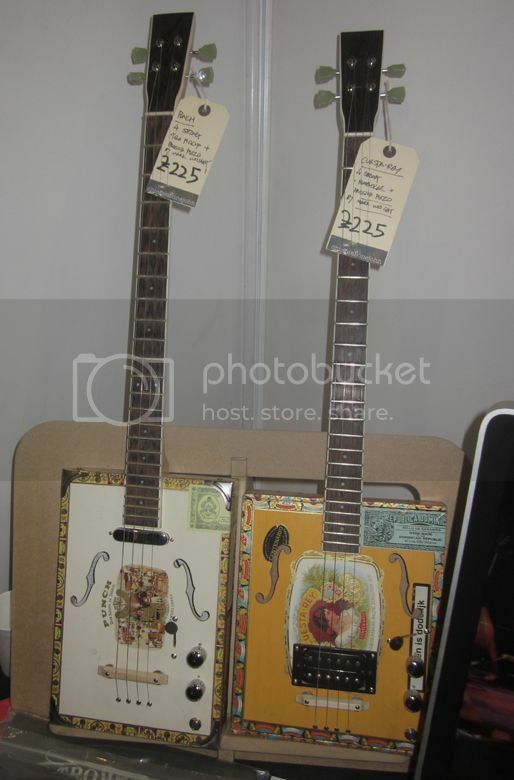 At the other end of the price scale but also made in the UK we have the wonderful products of Chickenbone John, including cigar box guitars and diddley bows. Chickenbone John himself was on-hand to demonstrate these unique instruments. 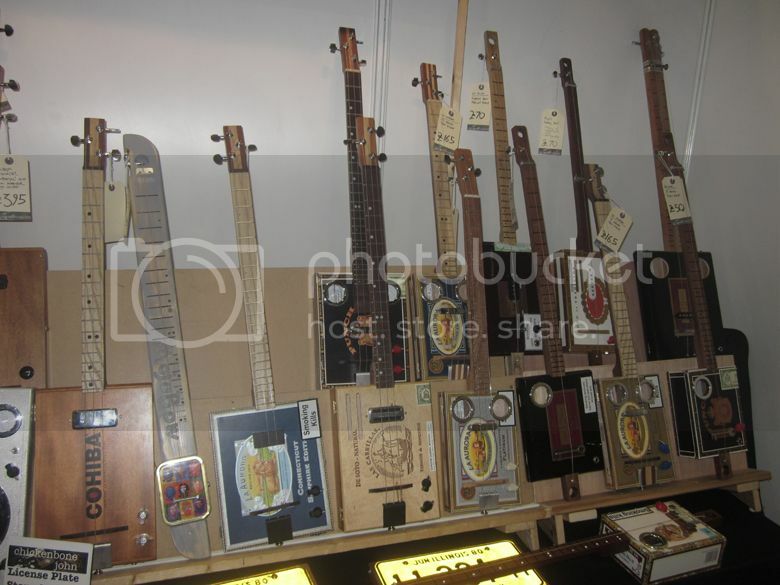 He also stocked a few CBGs from other makers. 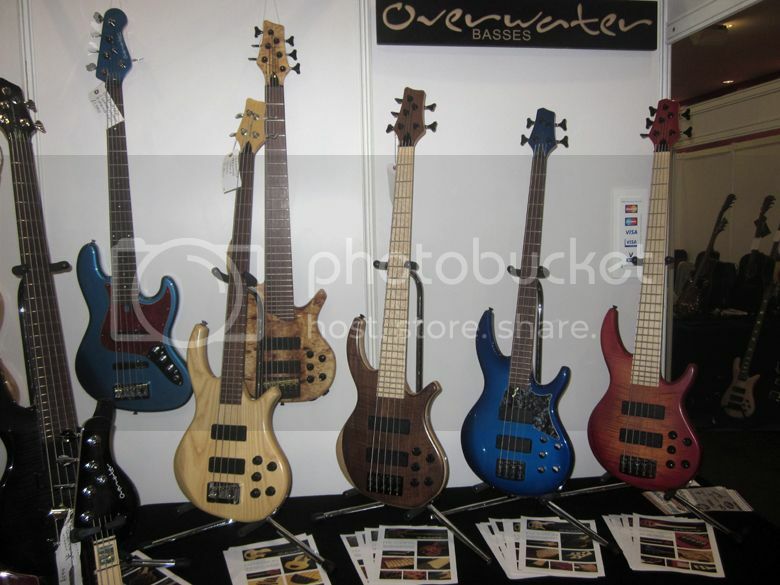 UK's finest, Overwater Basses (pictured above and below). Overwater's head guru, Chris May, explained to me that as well as their standard and mid-price ranges, they have just launched the Overwater by Tanglewood series of basses, which brings the high standard set by Overwater's boutique instruments to the masses in the shape of off-the-peg basses built to Overwater's specification by Tanglewood in the far east. 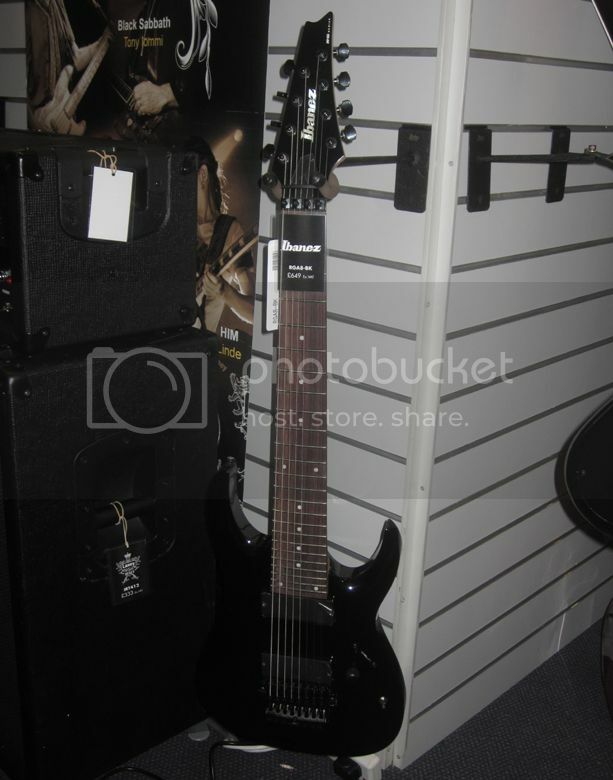 Stormshadow Guitarworks (above) are a small UK Custom Shop, based in Sheffield, offering custom-built guitars in the Charvel mould with comparable quality and prices to similar USA-made guitars. 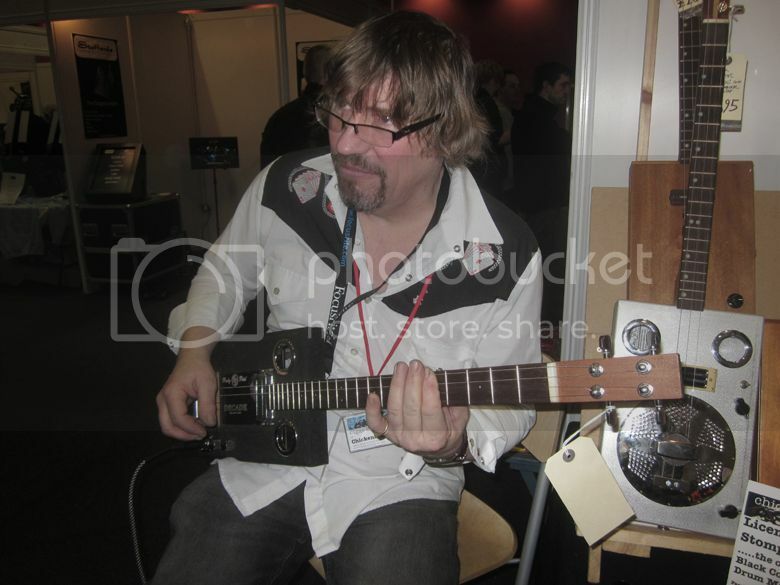 John Hornby Skewes, a UK-based distributor, were also present with a stand which included the British-based Vintage brand of high quality but budget priced instruments. 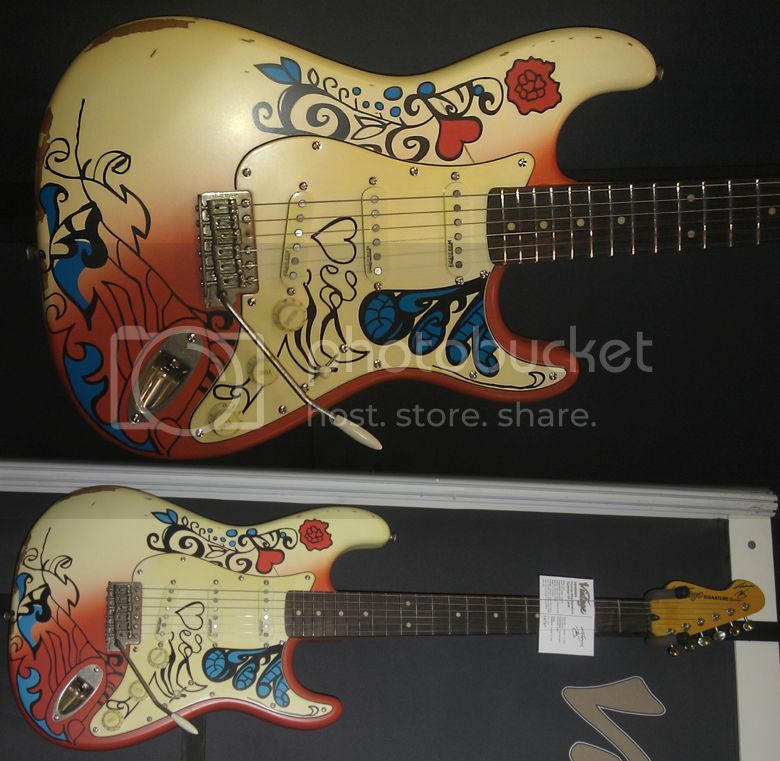 Vintage brand guitars that caught my eye were theVintage Icon V6MRHDX (pictured above), the signature guitar of Thomas Blug and obviously inspired by Jimi Hendrix's "sacrificial" Monterey Pop Festival Strat (and arguably better looking than Fender's own re-issue of the same) and the Vintage Gordon Giltrap Signature Series VE2000GG-12 twelve-string (pictured below). 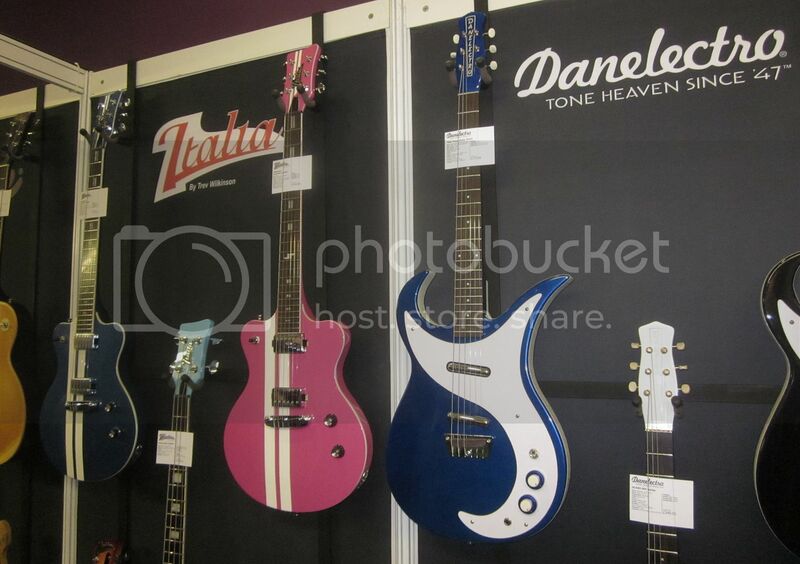 JHS also had on display Italia and Danelectro guitars, including the "new" Danelectro Wild Thing based on a 1960s prototype (above). 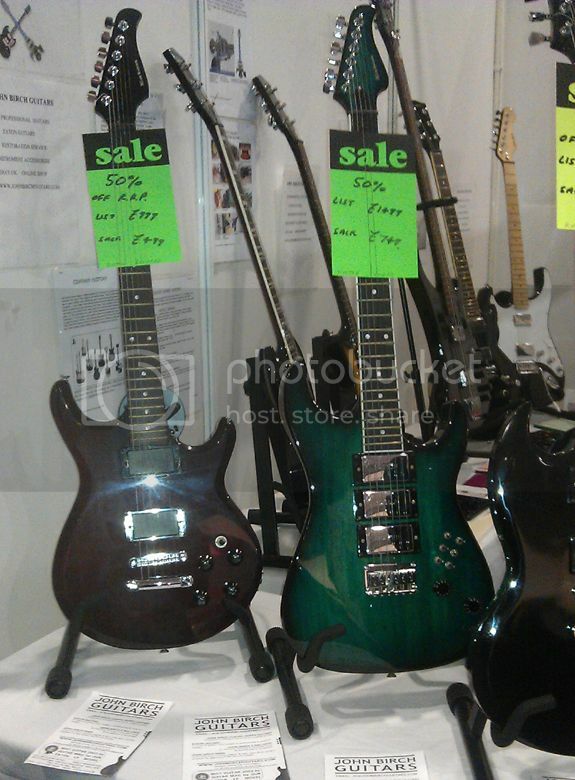 Also distributed by JHS are Trev Wilkinson's Fret King guitars, which are available in a Green Label and STVDIO (Made in the UK) series and also a more budget conscious Blue Label and Black Label (Made in the Far East) series. Designs obviously owe quite a lot to some of the American classics, but with Wilkinson's own innovations. 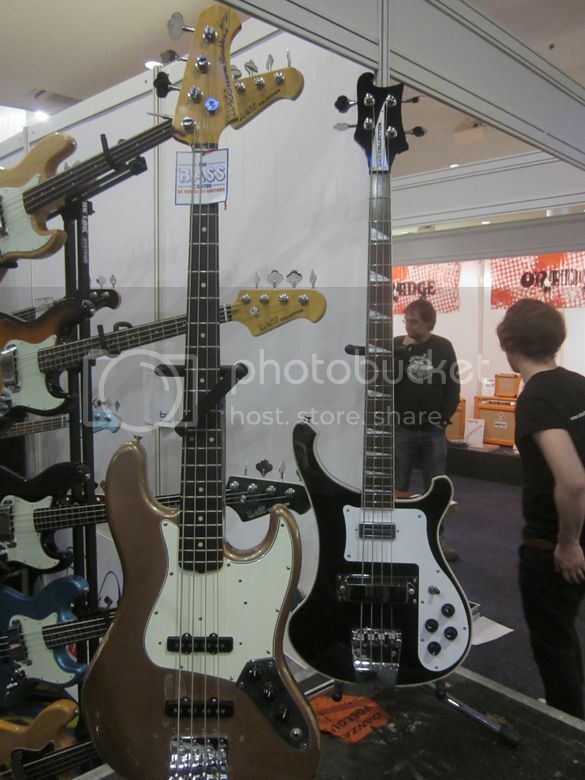 London's own Bass Centre were unveiling their new Bass Collection, which included the above bass which at first I thought was a tribute so certain Soviet-era Russian-made instruments, but is, it turns out, a Bill Wyman tribute. 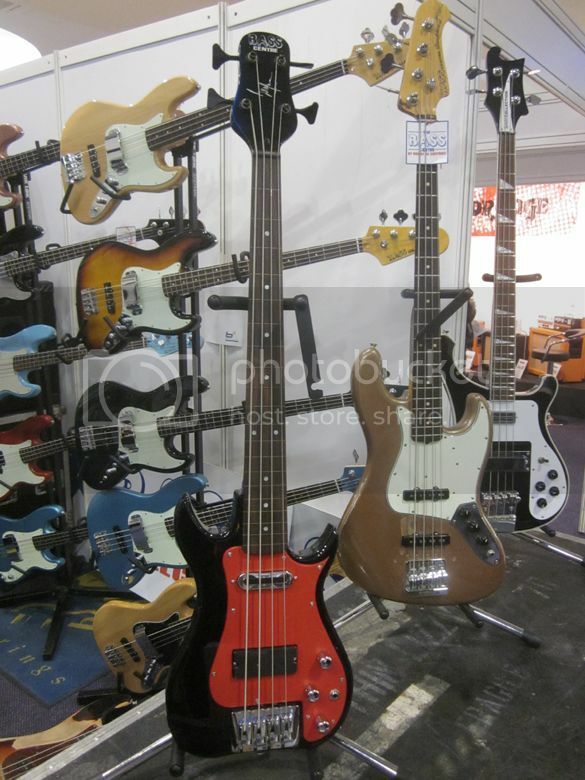 And why did I find this particular Bass Centre J-style bass so familiar? 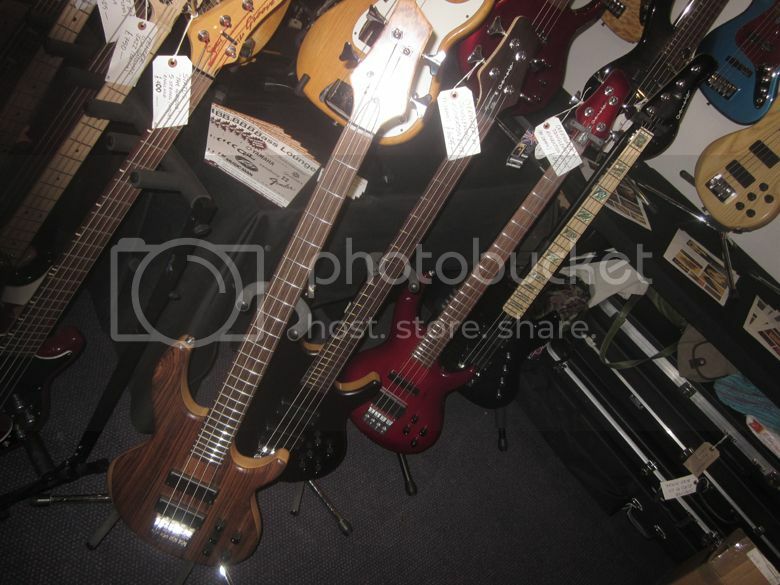 Well, it's nicknamed the Blockhead, and is a copy of Norman Watt Roy's 1962 Fender Jazz Bass which I featured on this blog only last month. 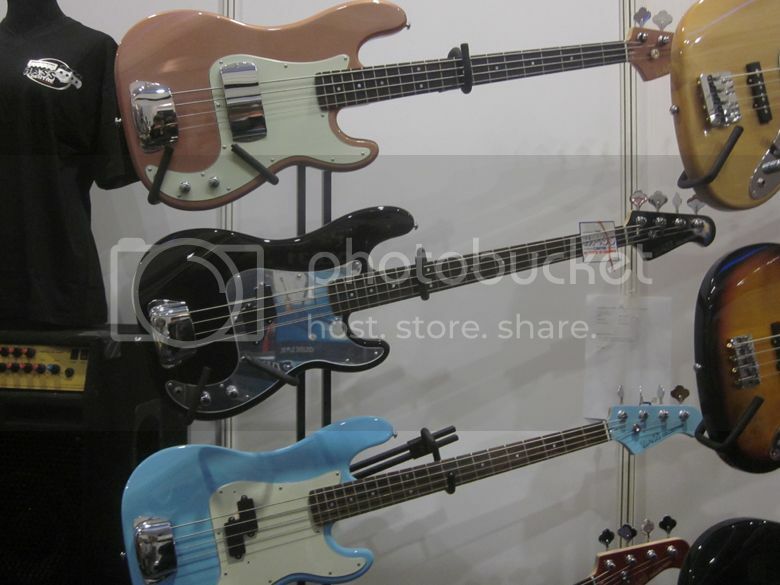 Note also the R***********-like bass standing next to it; I can't imagine a certain company will be too happy about that. 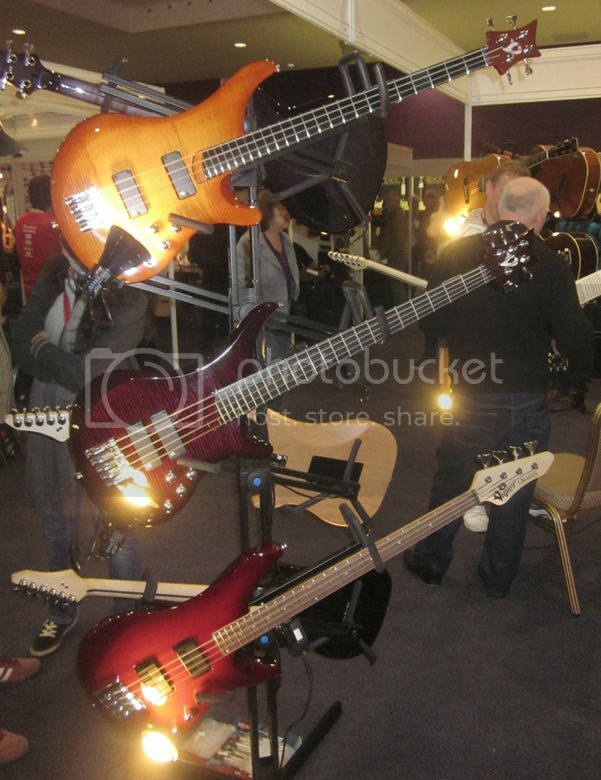 Bass Centre also had a few of their own P-basses on display (above). 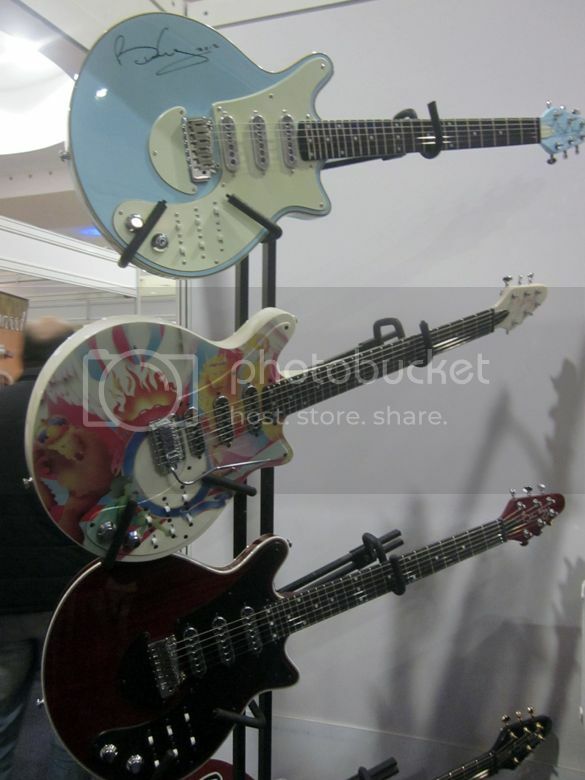 Surely the one in the middle must be a Phil Lynott of Thin Lizzy tribute edition. 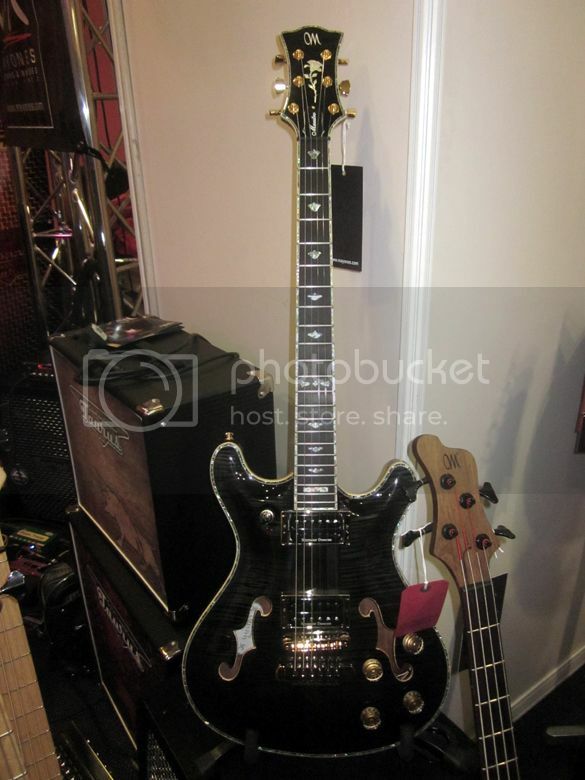 Speaking of tribute and signature guitars, BM Guitars were in attendance with a bunch of guitars based on Brian May's Red Special (above) including one emblazoned with the Queen logo (close-up below). It's certainly an improvement on the one they produced with Brian's face on it a few years ago. ...and Yamaha, who were displaying several of their new "souped-up" Pacificas (above). 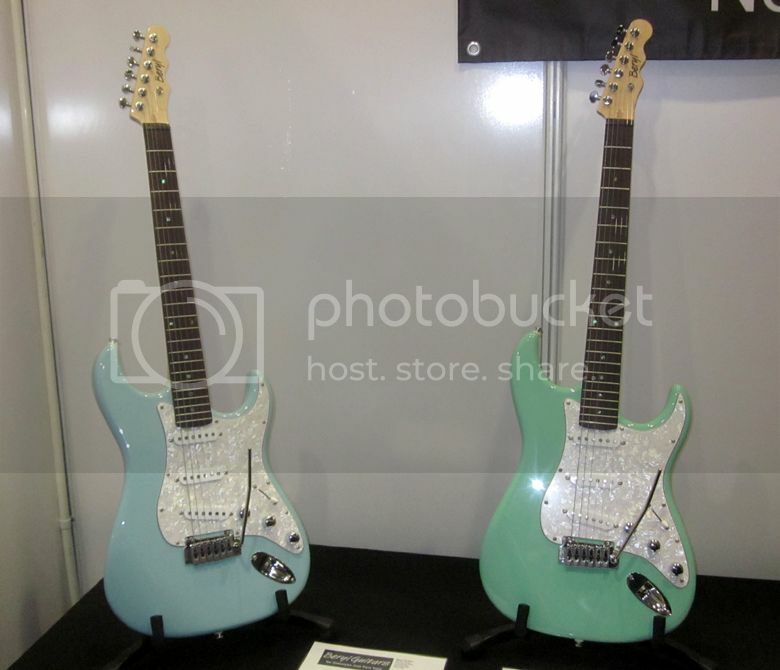 Seeing as the Pacifica is often thought to be an entry-level very basic guitar, I couldn't stop the expression "polishing a turd" coming to mind. 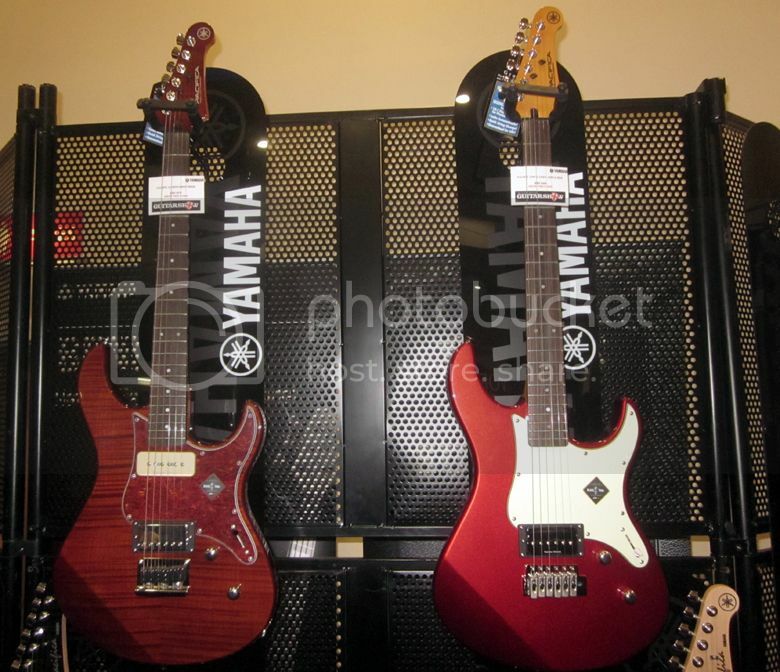 They are nice enough looking guitars, but perhaps Yamaha should have slapped another name on them. 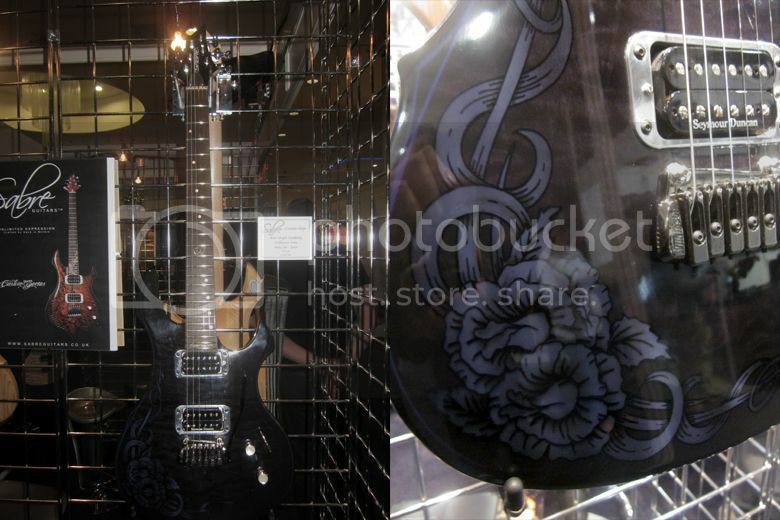 Finally at the Piccywood booth, we saw guitars that had been decorated using the art of pyrography (literally, "writing with fire") by artist Chris Martin. 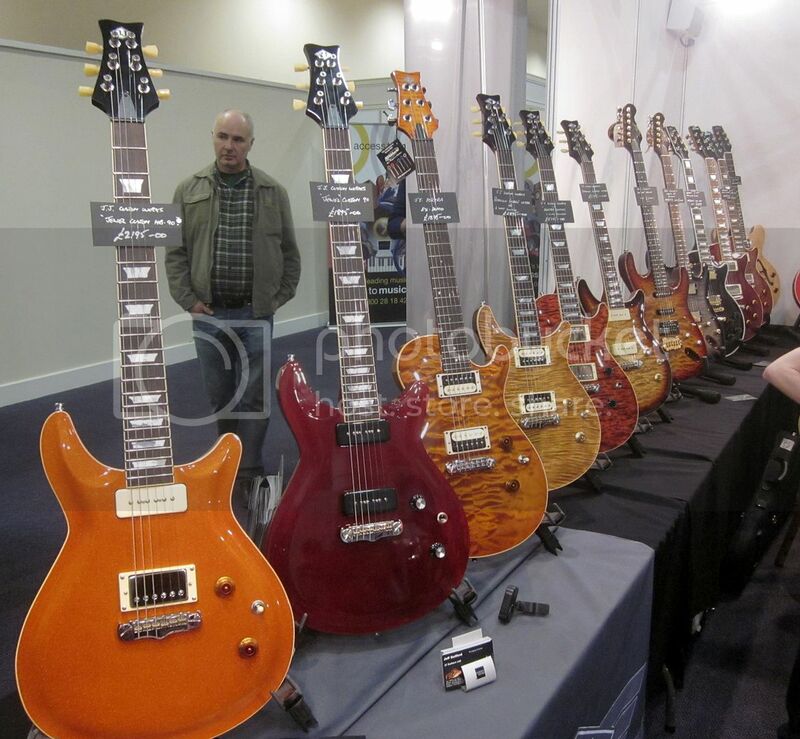 For me, the great thing about the show was seeing so many UK guitar makers together under one roof - and they were only the tip of the iceberg - there are plenty of others who weren't in attendance. All in all it was a very entertaining day out, and I enjoyed meeting and chatting to the various luthiers and stallholders.